Mayor Jim Gray and Marine fighter pilot Amy McGrath will square off Tuesday. Kentucky's 6th Congressional District sits smack dab in the middle of the Bluegrass State -- but come Tuesday, it will find itself at the epicenter of the Democratic Party's quest to retake the U.S. House of Representatives in the November midterms. 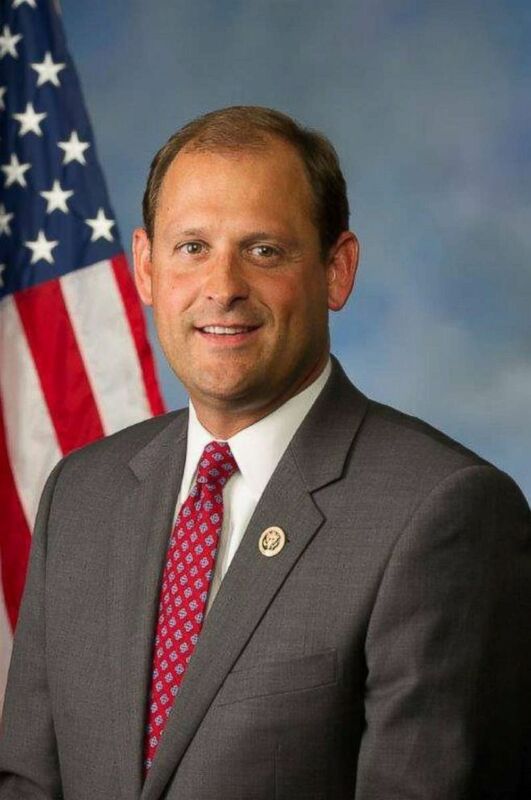 The district, which includes Lexington and Frankfort, the state capital, is currently represented by Republican Congressman Andy Barr, but Democrats are hoping the candidate who emerges from Tuesday's primary can capitalize on what Democrats hope is a favorable national political environment and flip a seat that re-elected Barr and voted for Donald Trump by 22 and 15 percentage points, respectively, in 2016. (Congressman Andy Barr/Facebook) GOP Congressman Andy Barr, who represents the 6th district in Kentucky. Lexington Mayor Jim Gray and former U.S. Marine fighter pilot Amy McGrath present Democrats with two strong candidates that could potentially unseat Barr. Gray and McGrath, who are also running against state Sen. Reggie Thomas and three other Democrats in Tuesday's primary, have both proven to be prolific fundraisers with uniquely compelling backgrounds who could give Barr the toughest race of his political career. McGrath has attempted to portray Gray, who has been the mayor of Lexington for more than half of the last decade, as the establishment pick in the race amid reports that the Democratic Congressional Campaign Committee (DCCC) urged Gray, an independently wealthy former businessman who is openly gay, to run for the seat. Of attempts to paint him as the establishment candidate in the race, Gray told ABC News they are "delusional" and "a red herring, fully," pointing out the fact that 75 percent of his campaign donations have come from Kentucky as evidence that he has plenty of grassroots support. (Andy Lyons/Getty Images) A scenic photo of Memorial Hall on the campus of the University of Kentucky on October 25, 2013 in Lexington, Ky. The DCCC did not respond to a request for comment from ABC News on whether they urged Gray to seek the seat. Gray adds that he is not on the organization's list of preferred candidates as part of its "Red to Blue" program as evidence that he is not the party's pick. "I’m nowhere on that list. If you’re not on their list, then you’re not endorsed by them," he said. "If you’re not being financially supported then you’re not being supported." For some political observers in the area, like University of Kentucky political science professor Stephen Voss, the squabbling over who's the outsider or insider won't be the major theme weighing on 6th Congressional District voters Tuesday. "Neither these charges that Gray is an insider, nor these charges that McGrath represents people outside Kentucky, really sound like the kind of thing that sways voter choice," Voss told ABC News. "Voters are going to judge Gray and judge McGrath based on which one is likely to give them the type of representation they’d like." Of the DCCC and the national party's involvement in the race, Voss says it's par for the course for the party to try and recruit the most electable candidates. Regardless of labels, the candidate who advances Tuesday has a tough task ahead to unseat Barr, who is facing just one little-known challenger in the Republican primary. McGrath has never run for political office, but she was vaulted into the national spotlight after her campaign announcement ad highlighting her historic military background went viral. McGrath was the first woman in the Marine Corps to fly into combat in an F-18 jet, and served three tours of duty abroad. When she was 12 years old, she wrote letters to members of Congress asking them to change the law against women flying in combat, which they did in 1991. Now, she's hoping to translate that national buzz into votes in Kentucky's 6th. While she has spent much of her adult life in and around Washington, D.C. -- in Annapolis, where the U.S. Naval Academy is located -- McGrath has embraced an outsider mentality in her race against a more established Democratic politician in Gray. (Patrick T. Fallon/Bloomberg via Getty Images) Amy McGrath, former U.S. Marine and Democratic congressional candidate for Kentucky, speaks during the 2018 MAKERS Conference in Hollywood, Calif., Feb. 6, 2018. "People are fed up with the dysfunction and when they look and say, 'Who are we going to send as a leader to Washington, is it going to be more of the same types of people, or is it going to be somebody different?'" McGrath mused in an interview with ABC News Friday. McGrath scoffed at Gray's claim that he is not the preferred candidate of the Democratic establishment. "He has the backing of all of the establishment, he was recruited by Steny Hoyer and the Democratic Party," McGrath said, referring to the Maryland Congressman who as Minority Whip is the second-ranking Democrat in the U.S. House below Nancy Pelosi. While Hoyer's leadership super PAC -- AmeriPAC -- has donated $5,000 to Gray's campaign this cycle, according to OpenSecrets, Gray is hardly alone from receiving the top Democrat's financial support. More than 90 Democratic House candidates, including challengers and incumbents, have received a donation from AmeriPAC, according to OpenSecrets. "This is a guy who we were told he’s getting enormous pressure from the national party to get in the race. So I don’t know how much more establishment you can get other than that," McGrath said. 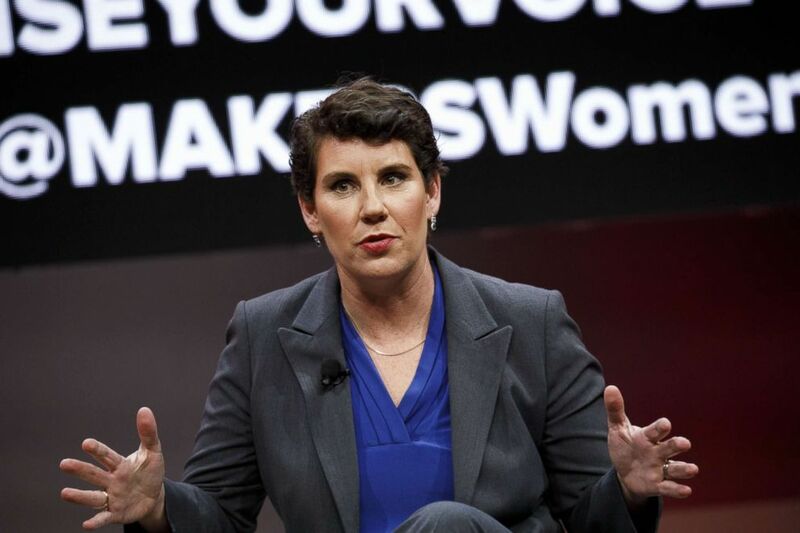 At a recent debate, McGrath pushed back against criticism that she spent most of the last two decades living outside of Kentucky -- which she says she could not control given her military career. “Look, the fact is that I served my country, okay. I can’t do both. I can’t live here for 20 years and also be a United States Marine, serving the people of Kentucky,” McGrath said in April. In a year that has seen a record number of women launch campaigns for the U.S. House and other political offices around the country, McGrath's push has also highlighted her experiences as the mother of three children. She has proven to be an able fundraiser despite Gray's established political reputation, and raked in more than $1.7 million during her campaign, according to reports filed with the Federal Election Commission (FEC) earlier this month. “The reason why we have 19 percent women in places like Congress is because we don’t run at the same rate as men. And I think one of the things we‘re starting to realize is we have to step into the arena,” McGrath told ABC News Political Director Rick Klein and Senior Congressional Correspondent Mary Bruce in an interview on the "Powerhouse Politics" podcast earlier this year. McGrath, who also served as an adviser to California Democratic Rep. Susan Davis for several years, says she can appeal to both Democrats hungry for a non-traditional candidate, as well as Republicans disillusioned with the current trajectory of the national party. "I’m a candidate that speaks to those folks here in Lexington too because I can talk about a lot of the issues. I also have international experience and I am a little bit younger than many of the candidates they’ve seen," McGrath said. "I’ve had Republicans throw me fundraisers in this primary. My husband is a Republican. So many of them that feel that the Republican Party has gone off the deep end and they want somebody who’s just reasonable and honest." McGrath said the biggest difference between her and Congressman Barr is health care, adding that his vote for the House Republican plan to repeal and replace the Affordable Care Act "enthusiastically" puts that contrast in stark terms. "Health care is the number one issue. That's what I launched my campaign on, and it's still the number one thing," McGrath said. Mayor Gray goes to Washington? Gray has been mayor of Lexington since 2011. Before that, he found success in business as chairman and CEO of Gray Construction, the company he took over when he was 19 years old, after his father's death in 1972. Now, Gray is hoping the trust he's earned from Lexington voters will transcend to the 6th District and propel him to victory on Tuesday. (Alex Slitz/Lexington Herald-Leader via AP) Lexington Mayor Jim Gray speaks to the crowd before the Lexington-Fayette Urban County Council votes to move two Confederate-era statues from downtown Lexington at the Lexington-Fayette Urban County Government Center, Aug. 17, 2017. Gray is not shy about citing his government experience as evidence he'd be effective in Washington. He also pushes back forcefully against the establishment label that McGrath has tried to stick on him. "That's delusional," Gray said, "Sure I’ve had some support from individual Democratic members of Congress that believe that I would be a good representative in Congress because of my background, because of my experience, because of performance and results,"
Gray asserted that McGrath's national appeal and donations from celebrities like George Clooney, who has Kentucky roots, indicates that she does not have the same level of local support or know-how he does. Gray, who cites his desire to defend and strengthen the Affordable Care Act and emphasis on the opioid crisis as the biggest contrast between him and Congressman Barr, summed up his final pitch to voters in one word: "electability." 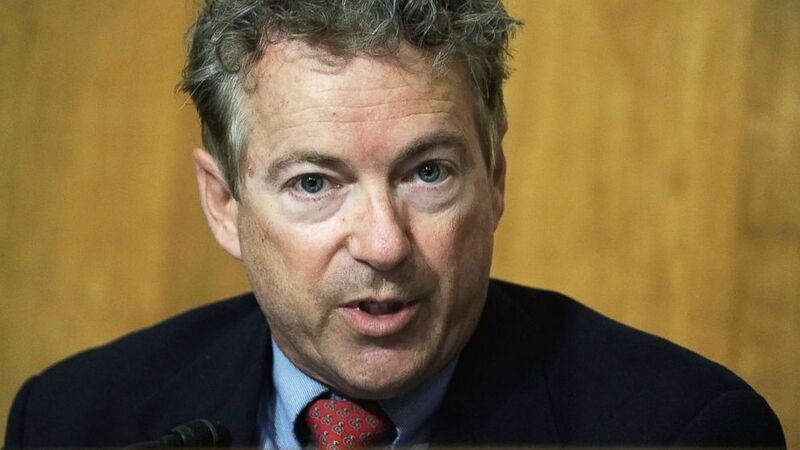 (Alex Wong/Getty Images) Sen. Rand Paul speaks during a Senate Foreign Relations Committee meeting April 23, 2018 on Capitol Hill in Washington. "I ran statewide in 2016 against Rand Paul in a really tough and challenging environment," Gray says of his unsuccessful U.S. Senate campaign. "I beat Rand Paul in the 6th district, and that shows that I can beat a Republican incumbent. I know this district inside and out." Will the 'blue wave' come to Kentucky? Democrats need to flip 23 U.S. House seats to take back the majority in Congress' lower chamber, and many of the districts they are targeting in that quest are just like Kentucky's 6th -- districts that have both urban, suburban and highly-educated voters who have been turned off by the presidency of Donald Trump. But Kentucky's 6th, which had been represented in Congress by Democrat Ben Chandler for most of the early 2000s, has been drifting steadily rightward in recent years following Chandler's 4-point loss to Barr in 2012. 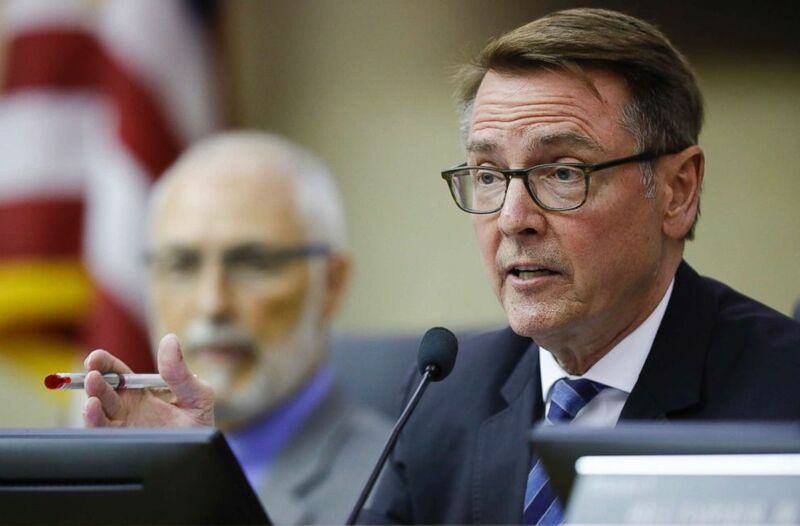 Voss says that loss is in part due to the redistricting process that, following the 2010 election, added voters to the 6th district with whom Chandler had not yet established a personal relationship. "When you get new voters it doesn’t matter what their party leanings are, you’re at more risk with them than you were with the people whom you’ve built that personal vote," Voss said. "So it’s not a surprise that Chandler ultimately did worse in those new precincts." 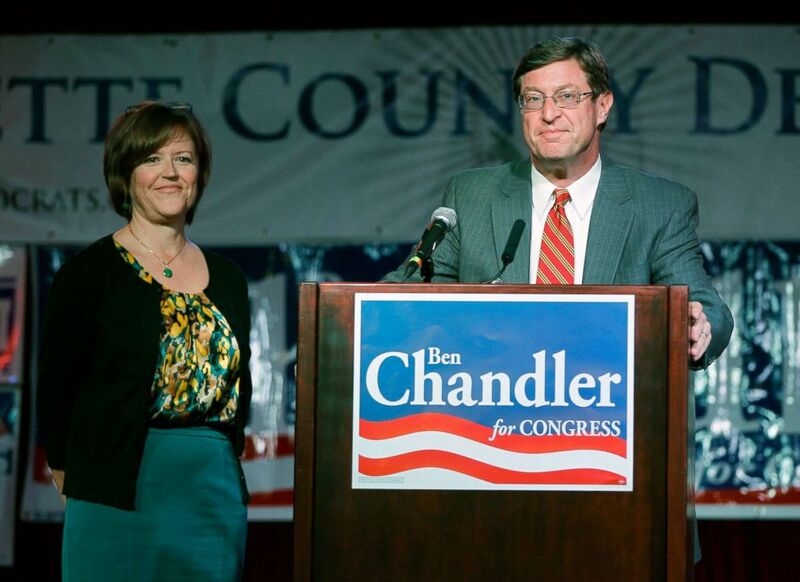 (Lexington Herald-Leader/MCT via Getty Images) Congressman Ben Chandler, with his wife Jennifer at his side, gives his concession speech on Nov. 6, 2012 in Lexington, Ky. He served as a Kentucky congressman from 2004 to 2013. The district has a unique combination of Democrats concentrated in Lexington and Frankfort, and highly-educated, suburban Republicans who live in and around those cities. 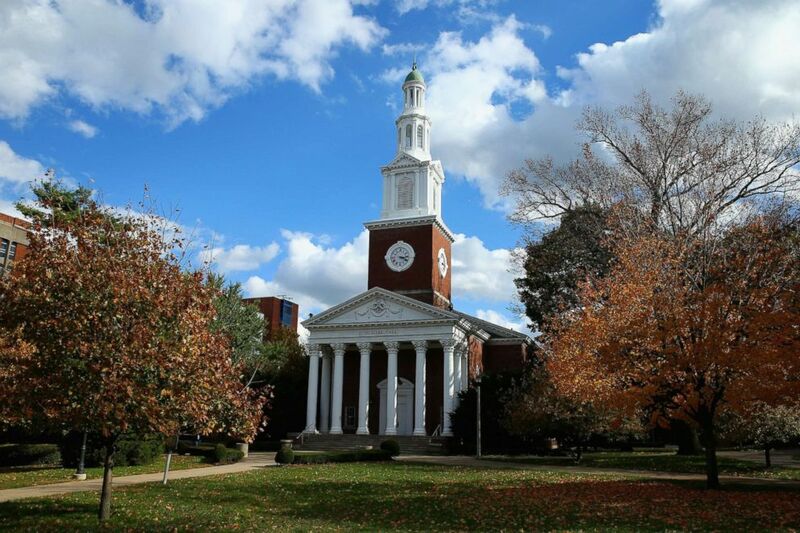 Kentucky's 6th district, home to University of Kentucky's main campus, has the highest percentage of residents with a bachelor's degree or higher at 31.7 percent than all of the other congressional districts in the state, according to data from the U.S Census Bureau. Gray and McGrath both emphasize their crossover appeal, but their two pitches come from opposite ends of the spectrum. "Folks are really looking for somebody who’s different but somebody who has also proven themselves and has served their country," McGrath said. "I think people just want somebody to stand up and throw the b------- flag on what’s going on in our country, and that’s kind of what I’m doing." "I’ve been in a non-partisan role as the mayor of Lexington for eight years and four years before that as a city council member," Gray said. "You learn to work together with people of different points of view. I’ve learned how to do that."